When we look around us in what we astronomers call "the nearby Universe", most of the galaxies that we see can be divided into two basic groups. 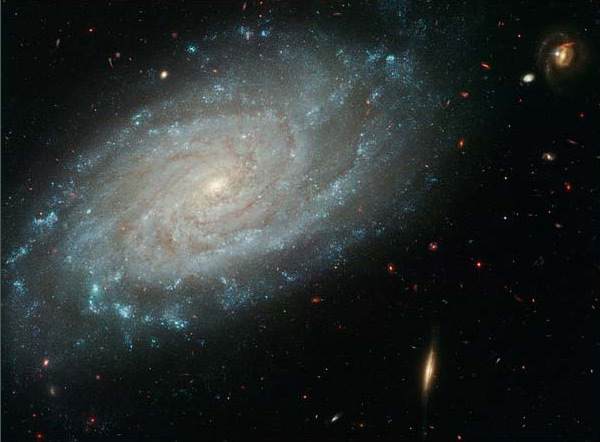 There are the "disk" galaxies, sometimes called "spiral" or "late type" galaxies, which are flat like a saucer. We of course live in a disk galaxy, and our nearby companion, the Andromeda Galaxy (M31), is one also. Then there are the "elliptical" or "early type" galaxies. These look more like round balls of stars from any angle, though they can be slightly flattened. Have a look at this previous post for more information and more pictures of disk galaxies and elliptical galaxies. Also see this recent post for a discussion of how we measure and quantify galaxy type or morphology. Although it is not apparent just from looking at the images of these galaxies, disk and elliptical galaxies are different in several other ways besides their morphology. 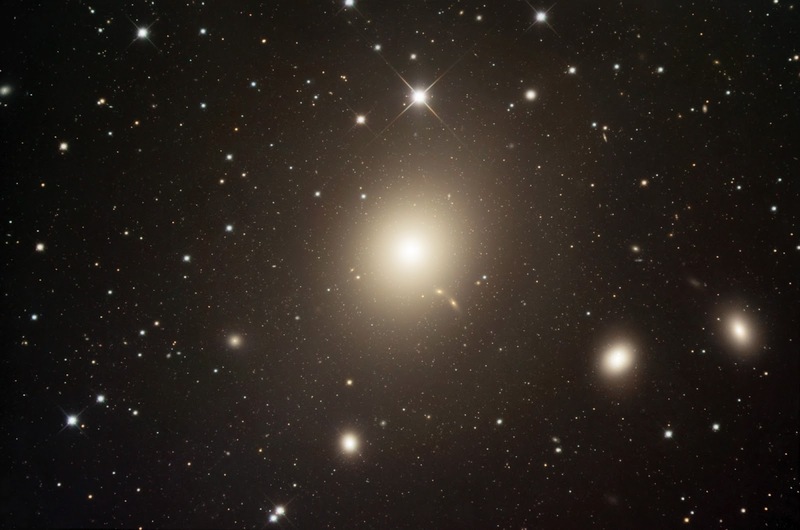 Disk galaxies also contain cold gas, which provides fuel for new stars, while elliptical galaxies don't have much gas and contain very few young stars. The motions, or orbits, of the stars within these galaxies are also very different. In disk galaxies, the stars and gas move around the galaxy on regular, nearly circular orbits, with smaller up and down motions, like animals on a merry-go-round. In elliptical galaxies, the stars move around with more random motions like a swarm of bees. Ever since astronomers first noticed that galaxies came in these different types (which goes all the way back to Edwin Hubble), they have been wondering why. Are these galaxies different because they had different properties from birth? Or could something happen to galaxies to make them one way or the other -- were they shaped by their environment or even perhaps by a traumatic event? This is sometimes called the "Nature or Nurture" debate. An important clue came from galaxies that don't fall neatly into either of these categories, like the ones shown above. They aren't very common, but we see them often enough to know that they could be telling us something important. These strange-looking galaxies tell us that sometimes, galaxies can interact and even collide. See this previous post introducing galaxy mergers. This inspired theorists to try work out in more detail just what would happen to galaxies if indeed they did interact with one another. We set up "particles" that represent stars and gas in two disk galaxies, for example similar to the Milky Way and M31. We also include the "halos" (extended spherical envelopes) of dark matter that we now believe surround all galaxies, and make up most of their mass (why we believe that is another topic for another day). Fortunately, we think that dark matter interacts with itself and with normal matter according to the usual laws of gravity, and doesn't feel any other forces, so it is actually relatively easy to program a computer to predict what it will do (even though we don't know what it is). Then we set the galaxies on a collision course and use a supercomputer to compute what would happen to the stars, gas, and dark matter as the galaxies move towards one another and eventually begin to interact. There are several nice animations of these kinds of simulations in previous blog posts -- here and here. 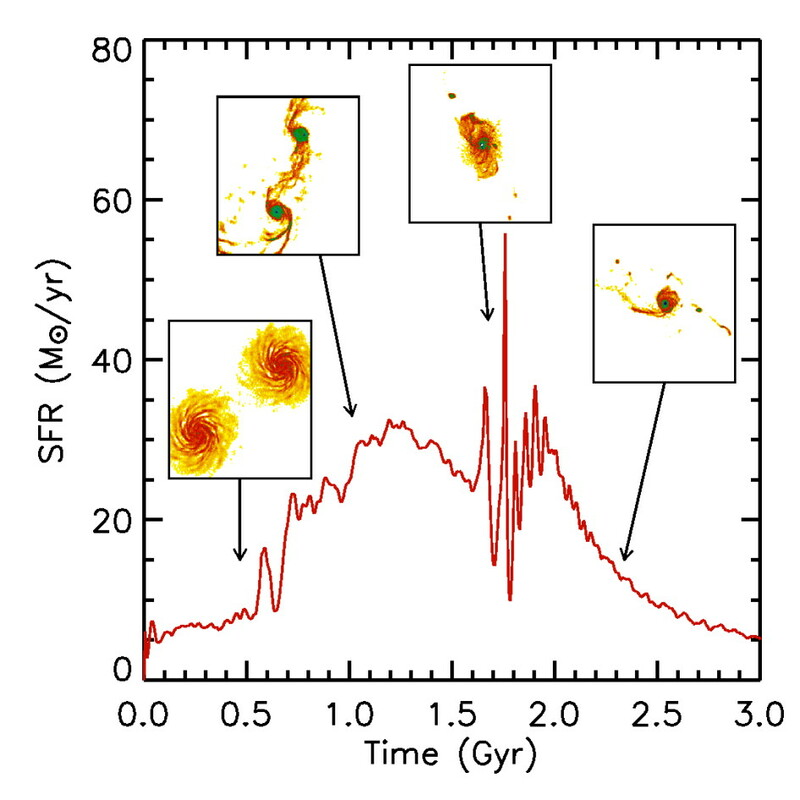 The picture above shows a time sequence of snapshots from such a computer simulation of a merger of two nearly equal-mass galaxies. The color scale shows the density of the stars, and the little number in the top left of each panel is the time that has elapsed since the beginning of the merger, in billions of years (Gigayears). The dotted line shows the trajectory of the orbit. The first thing you probably notice is the long streams of stars that are drawn out on both sides. These are called "tidal tails" and are caused by the same kind of tidal forces that the Moon exerts on the Earth (only of course much, much stronger). You might also notice that the centers of the galaxies seem to get denser and more compact. By the end of the simulation, 6 billion years later (remember we think the Universe is about 13.5 billion years old), the two galaxies have merged into one and the remaining galaxy no longer looks like a nice thin disk of stars -- it's a much rounder structure, more like the elliptical galaxies that we saw above. What is actually happening here? There is a lot of space between stars in galaxies relative to the size of the stars, so the stars themselves do not collide with one another. However, gravity can perturb those nice circular orbits that the disk stars were on. Basically some of the energy from the galaxies' motions relative to one other gets transferred to the stars, scrambling the orbits and making the stars move around more randomly. 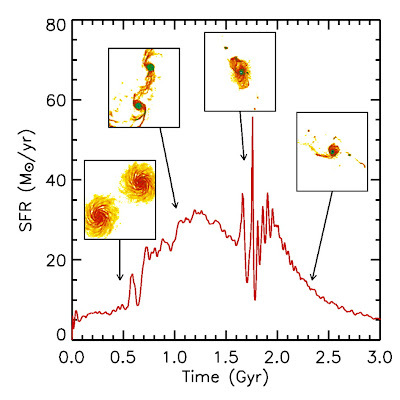 The gas that was in those two disk galaxies is also dramatically affected by the interaction. The gas gets driven into the nuclei of the galaxies, and when gas gets dense, it can form new stars more efficiently. So the rate of new starbirth goes way up as the galaxies interact and merge. I've shown a little graph here showing the rate at which new stars are being born as a function of time, along with pictures of the merging system along the way. As you can see, the rate of new stars being born spikes up as the galaxies start to interact, and peaks when the galaxies coalesce. It then dies off again as the gas gets used up. In addition, some of the massive stars start to explode as supernovae, which deposits a large amount of energy in the gas. This can heat the gas up and blow it away, removing the fuel for further star formation. 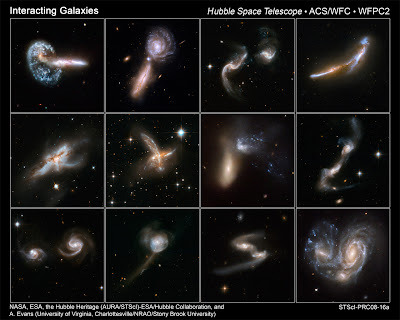 Observational studies have shown that galaxies in close pairs do seem to be forming stars more efficiently than isolated galaxies, which seems to support this picture. 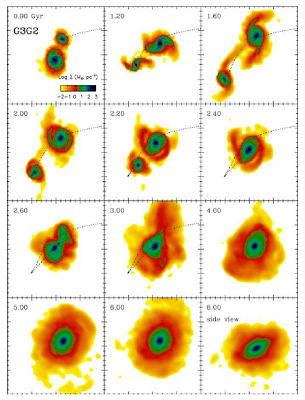 CANDELS will allow us to further study the connection between mergers and star formation, which will provide important tests for theories of galaxy formation. There is another very intriguing possible consequence of galaxy interactions. If there are massive Black Holes lurking in the centers of the progenitor galaxies, the strong torques during the merger could funnel the gas so close to them that it would begin to be accreted onto the Black Holes. 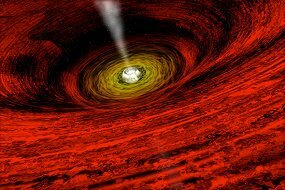 As gas approaches very close to the Black Hole, it forms a hot dense structure called an "accretion disk", which can glow very brightly (I've shown an artist's rendition here). These accreting Black Holes are called Active Galactic Nuclei (AGN), or Quasars, and have been the subject of other posts. Computer simulations of galaxy mergers suggest that these events could cause the Black Holes to grow very rapidly. Theorists have further suggested that the energy radiated by the accreting Black Hole could heat up the remaining gas and even blow most of it out of the galaxy! There is a beautiful animation of a simulation that tries to model that process here. To sum up, we think that mergers can change disk galaxies from flat to round, scramble their stars from regular circular orbits to random orbits, and maybe can activate black holes that blow away their gas and shut off their star formation. So perhaps all galaxies were born as disks and some get transformed into ellipticals by mergers. It's a nice story, but a number of open questions remain. Do we see enough mergers? Could there be other processes that are important? If mergers cause black holes to shine, why don't we see AGN preferentially in disturbed-looking galaxies? CANDELS is helping us to answer these questions. Great post. But on the last point, I thought that recent observations outside the optical were indicating that maybe it's just dust obscuring AGN in disturbed-looking galaxies. There is a great deal of discussion back and forth on this. As someone who studies galaxies but not AGN specifically (so a semi-outsider) my synthesis of the situation right now is that it seems that there is a relationship between merging and very active (sometimes dust obscured) accretion (e.g., big quasars; from the e.g., PG quasar studies [Bahcall?] or SWIFT studies [Koss et al.]). At lower accretion luminosities (e.g., Seyfert luminosities), most studies (including CANDELS) are finding weak or no evidence for merger enhancement of AGN activity.